According to a recent White House press release, John Deere will join a consortium of 18 companies and 6 universities partnering with the federal government to strengthen the U.S. manufacturing sector and boost advanced manufacturing. 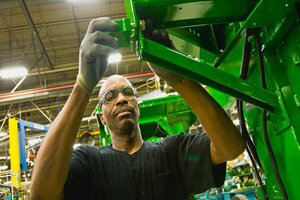 Deere, as one of 18 private sector partners in the new public-private Manufacturing Innovation Institute, will partner with an academic team fronted by North Carolina State University in a $70 million effort that also draws in five federal agencies including, NASA, the National Science Foundation, departments of Commerce, Defense, and Energy. The Manufacturing Innovation Institute will be focusing on the next generation of wide bandgap (WBG) semiconductors according to a Triple Pundit article, which could offer a significant improvement over conventional silicon semiconductors in terms of energy consumption and performance. John Deere has been an active participant in upgrading farm equipment and products, and has now joined the newly formed Manufacturing Innovation Institute in taking steps to strengthen the broader U.S. manufacturing sector, according to recent news.